The warmest wishes are part of every anniversary and special celebrations. If you want to be original, send this gift basket to celebrate the day in question. The basket features two teddy bears and a delicate box of Godiva Coeur Iconique which, inside, offers a selection of the finest white, milk and dark chocolates. And to round it off, a toast with Freixenet Excelencia Brut sparkling wine. I would like to be sent one of these too! Two cute teddy bears, each measuring 28 cm. One bottle of Freixenet Cava Excelencia Brut sparkling wine. The legendary Godiva heart is one of those gifts you just have to give. Its intricate design, inspired in Art Nouveau, and six hearts in classic white, milk and dark chocolate capture the true essence of Godiva. 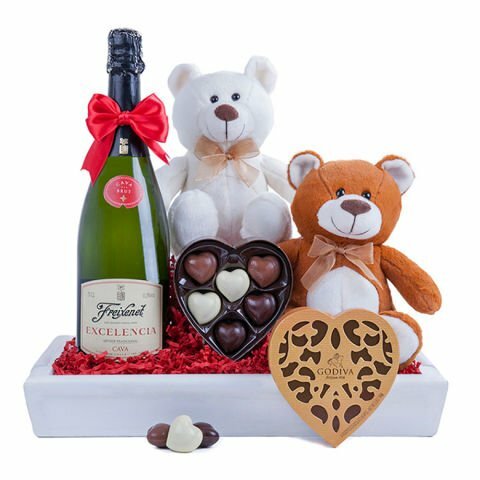 The basket features two teddy bears and a delicate box of Godiva Coeur Iconique which, inside, offers a selection of the finest white, milk and dark chocolates.